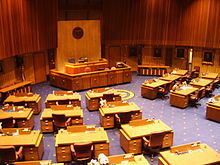 The Arizona Senate is part of the Arizona Legislature, the state legislature of the US state of Arizona. The Senate consists of 30 members each representing an average of 219,859 constituents (2009 figures). Members serve two-year terms with term limits that limit Senators to four terms for a total of eight years. Members of the Republican Party are currently the majority in the Senate. As with the Arizona House of Representatives, members to the Senate are elected from the same legislative districts as House members, however one Senator represents the constituency, while for the House there are two Representatives per district. This districting system is similar to those of the Idaho and Washington State Senate. In political science, this type of legislative district is called a multi-member district. The Senate convenes in the adjacent legislative chambers at the Arizona State Capitol in Phoenix. Arizona, along with Oregon, Maine and Wyoming, is one of the four U.S. states to have abolished the Office of the Lieutenant Governor, the nominal senate president in many states. As a result, the Senate elects its own presiding officer, the President of the Senate, who presides over the body, appoints members to all of the Senate's committees and to joint committees, and may create other committees and subcommittees if desired. The Senate President also appoints a President pro tempore, who serves for the duration of a session of the legislature, to preside in his absence, and may appoint a temporary President pro tempore in the absence of the President and President pro tempore. The current President of the Senate is Republican Karen Fann of District 1, the Senate Majority Leader is Rick Gray of District 21. The current Minority Leader is David Bradley of District 10 with Lupe Contreras of District 19 as the Assistant Minority Leader. † Member was originally appointed. ^ "Member Roster". Retrieved February 24, 2019. ^ "Next lawmaker up: Sue Donahue is newest Arizona state senator". Retrieved October 17, 2016. ^ "Arizona Senate Committees". Open States. Sunlight Foundation. April 9, 2014. Retrieved April 9, 2014.